A brand new service of three sailings a week between Belgium and Hull was announced yesterday by the UK’s leading port operator Associated British Ports (ABP). This service expansion is one of the results of significant investment in the Humber Container Terminals. 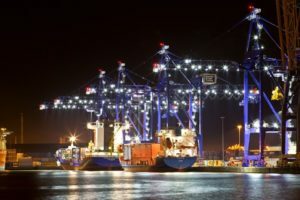 The new Ghent to Hull connection is expected to bring an extra 30,000 containers per year through the Port of Hull – the third largest short sea container port on the UK east coast. I-Motion Shipping, a recently established Ghent-based niche shipping company focusing on cargo routes between the UK and Western Europe, will call the Hull Container Terminal on Tuesdays, Thursdays and Saturdays, starting from Monday, 28 May. The 100m MV Cartagena will be the first to call at the Port of Hull. As we wrote last year, ABP announced an investment of UKP 50 mln (EUR 58.5 mln) into two container terminals on the Humber estuary – at the ports of Hull and Immingham – in order to more than double their annual capacity up to 550,000 TEU. For the upgrade of the Hull Container Terminal, nearly UKP 30 mln was allocated. Besides, 4 new Liebherr STS cranes were purchased, two of which were delivered in 2016 and the other two were received in April this year. This enabled the terminal to significantly increase the container handling capacity – some 400,000 per year. Container business on the Humber is booming with an increase of 23% in the last year. ABP’s four ports on the Humber (Grimsby, Goole, Immingham and Hull) handle around 17% of all of the UK’s seaborne trade. Every year the ports handle UKP 75 bln worth of trade, more than the Mersey, Tyne and Tees combined.